Butterfly Garden at Cemar, from left, Annabelle Strutt, Nick Woodrow, Nick Oram, Cheltenham League chairman, Chris Evans and Nathan Ridley. The Butterfly Garden project, which is based in Bamfurlong Lane near Staverton Airport, was one of the beneficiaries when the proceeds of the Cheltenham Football League’s charity cup competitions for the 2017-18 season were distributed to worthy local causes. 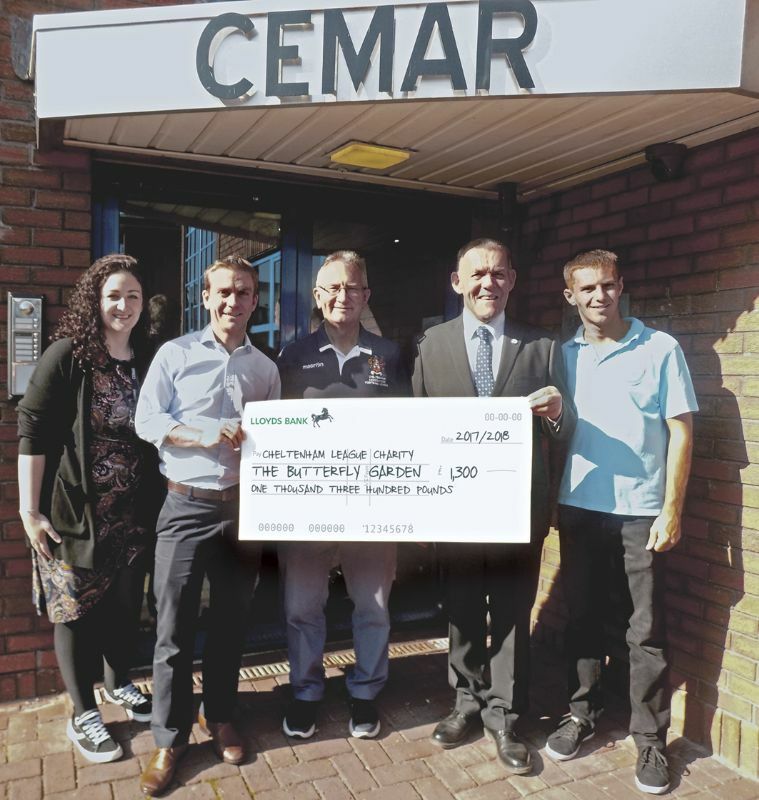 Represented by Chris Evans, the chairman of the trustees, and Nathan Ridley, a member of the project, The Butterfly Garden received a cheque for £1,300 at the offices of CEMAR in Barnwood, Gloucester. CEMAR, who specialise in contract event management software, sponsor the charities cup competitions and the presentation was made by Nick Woodrow, CEMAR’s chief operating officer, and Annabelle Strutt, chair of the company’s employee engagement forum. And the good news is that the company have recently agreed to not only continue the sponsorship for the current season but also to increase it. As a result of CEMAR’s sponsorship, every penny raised by the competitions goes directly to the charities that the Cheltenham League supports, which include the Sue Ryder Leckhampton Hospice and the Cheltenham Sports Association for the Disabled as well as The Butterfly Garden project. Sue Ryder Leckhampton Court Hospice provides expert palliative care and support for people who are living with a life-limiting condition, as well as supporting their families. 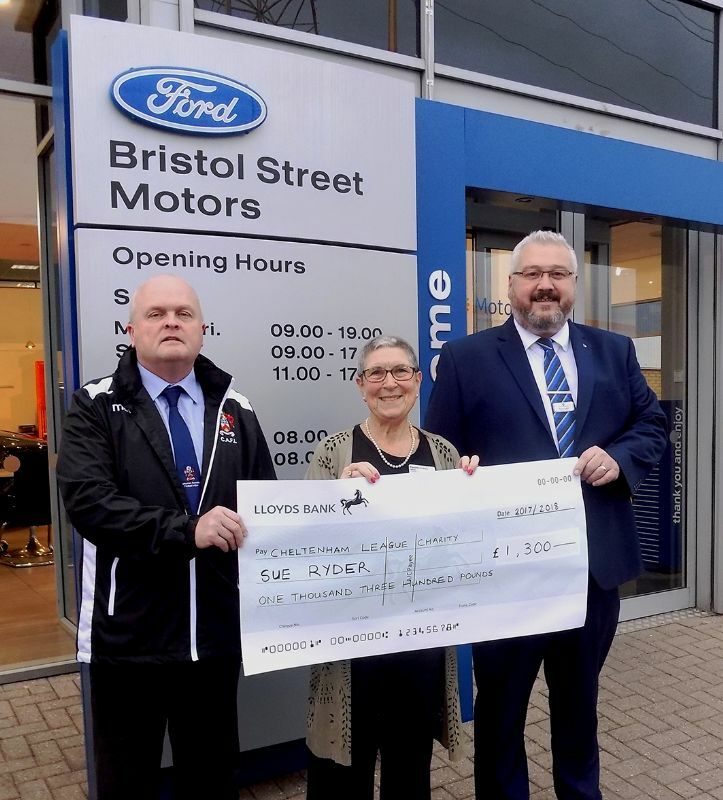 A cheque presentation took place at Bristol Street Motors Ford Cheltenham, the main sponsors of the Cheltenham League. Sue Ryder was represented by Paulette Vallois, fundraising ambassador volunteer. Cheltenham Sports Association for the Disabled runs swimming sessions for disabled people of all ages. It also offers recreation through competitive and non-competitive sport and recognises the potential of recreation through sporting activities to aid rehabilitation. 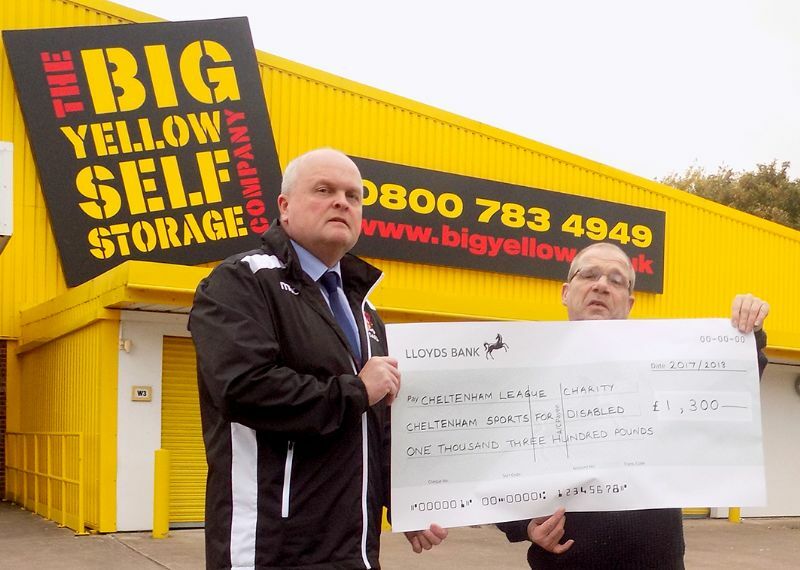 In a presentation at The Big Yellow Storage, David Bond, who benefits from much of the good work done by the Cheltenham Sports Association for the Disabled, collected the cheque on behalf of the association.